On May 16th five students completed their third and final year of the Ministry Program. Please plan to join us for the Ordination ceremony on August 20th to honor their accomplishment. Congratulations to Julie Dillon, LeRoy Harvey, Tricia Headley, Sue Quinn, and Taylor Swan! The excitement is building as we look forward to the new school year that begins September 12. The first term will be devoted to the study of New Thought. Classes meet every Tuesday evening from 6 to 9 pm. These classes are offered in an open and loving environment. They provide a unique and powerful opportunity for spiritual study, growth and healing to anyone interested in this experiential study, as well as to those interested in pursuing the three-year ordination track. Are you ready to live your brilliance? We invite you to take this journey with us. Your life experiences will expand and become enriched as you gain greater intellectual, emotional, physical, social, and spiritual awareness. I AM CURRENTLY A MEMBER of the Fellowship for Today ministry program and I am starting the last term of my second year. During this time, my heart and mind have opened up more than I could ever have imagined, especially after just finishing our last semester which gave us a glimpse into A Course in Miracles and A Course of Love. Are you ready to live your brilliance? 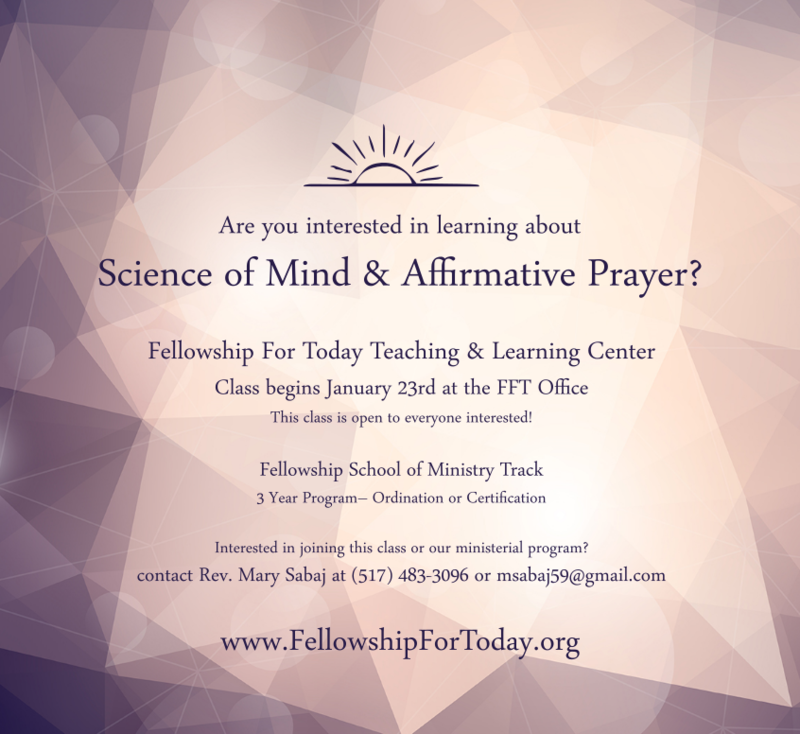 The Fellowship School of Ministry is a three-year series of classes for both personal spiritual growth and fulfillment and (if desired) ordination. We hope you will join us. Your participation will make the journey richer for each of us.